MARPOLE, VANCOUVER—The Musqueam First Nation has vowed to shut down condo construction to protect a major ancient burial site at the Marpole Midden. Infant graves were unearthed by heavy excavating equipment at the Vancouver location this week. 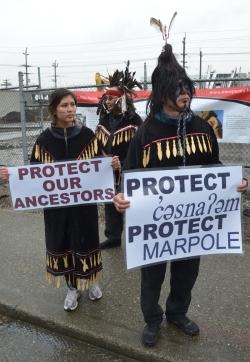 More than 100 Musqueam and supporters marched to the construction project at 1338 SW Marine on Thursday, May 3. The marchers included representatives from several First Nations. Musqueam are now occupying outside the site and say they will remain until protection for the site is assured. The move to protect their 4,000-year-old village site come after more burials were dug up by the condo developer. Construction stopped six weeks ago when the developer first disturbed intact burials. Musqueam leaders say promised talks with the developer, the city and the province have gone nowhere. The Musqueam reportedly offered a swap with developer Century Holdings for nearby land, but to no avail. The Marpole Midden is considered one of the most important in Canada and was named a National Historic Site in 1938. Union of BC Indian Chiefs Grand Chief Stewart Phillip announced that the site will "remain shut down until the province is prepared to come to the table and discuss a resolution to this situation." Musqueam Chief Ernest Campbell warned "never question our resolve or the resolve of our fellow First Nations, or of any one else for that matter, when it comes to protecting our sacred burial rights." Musqueam spokesperson Cecilia Point said supporters are welcome to come down and join the protest on the sidewalk or bring a tent and stay. This article and these images (and more) were originally published by the Vancouver Media Co-op.